We just returned from the trip we've been planning and dreaming about for a long time, three weeks jaunting around the American Southwest in our little motorhome; California, Arizona, Nevada, Utah, returning to Oregon through an Idaho perfectly flocked in snow. Some beautiful lands out there America! 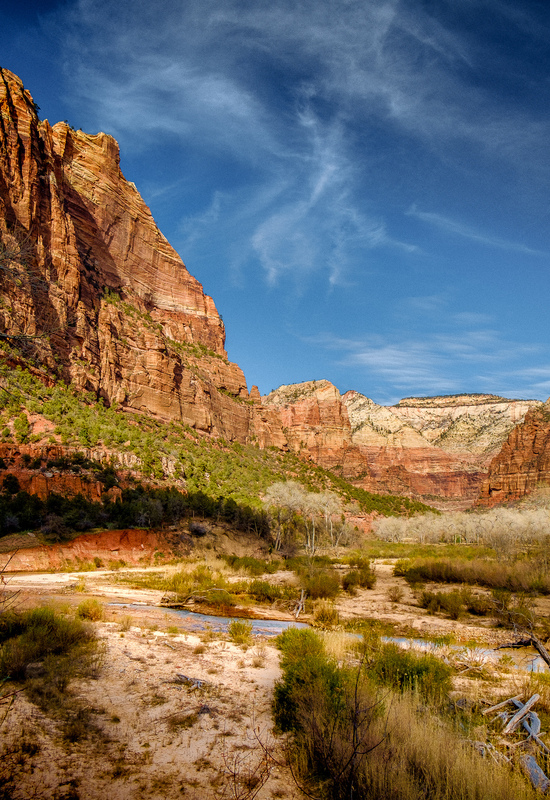 Towering cliff walls rise above the upper Emerald Pool at Zion National Park. To keep things interesting I gave myself a little photography challenge: Could I capture the trip through the fixed 23mm focal length of Fuji's X100t? No wide angle. No long telephoto. Just a 'standard' 35mm equivalent view of the world. There is some reasoning to this challenge, in that I plan to offer a photography class next year and the X100t seems like a great camera to use in teaching photography - small, simple manual controls, an excellent lens with a fixed focal length, and beautiful results. But I needed to put that assumption to the test, so I picked up a copy and dedicated it as my go-to camera for this trip. The pictures speak for themselves, this is an excellent camera! 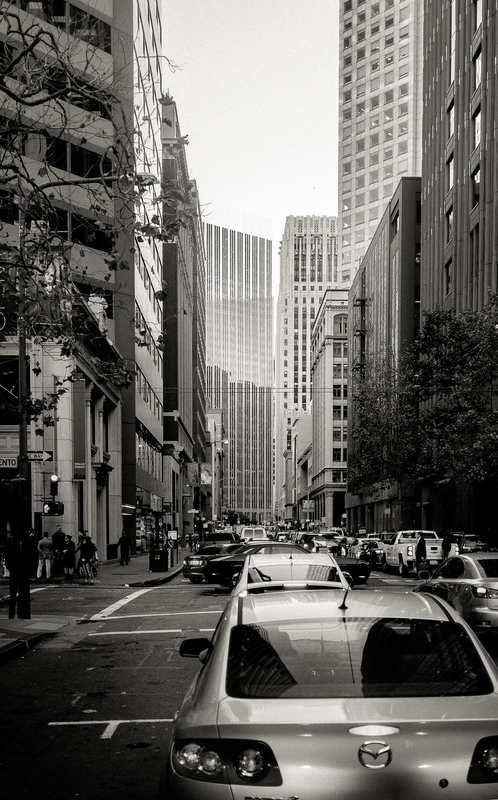 The fixed 23mm view provides a very natural feel, but still allows a bit of drama with the right angle. I added Fuji's teleconverter on some shots, giving a 50mm equivalent view for a bit more reach or isolation. The compact lens is sharper than any of the primes I use on my Fujifilm X-E1, which are arguably some of the best in the industry. The hybrid viewfinder is an amazing trick. WiFi image transfer sure is convenient. Built in neutral density means no extra filter to carry around. The leaf shutter is silent, eliminates shutter movement, and offers a high sync speed. All in a beautiful compact camera body that doesn't need a dedicated camera bag - loop it around your neck and it simply disappears until you need it. This is a joy of a camera, simply the best I have used. Nicely done Fuji! Most of these shots are from a few days we spent in both Zion National Park and the Grand Canyon National Park. This was my first visit to both, and wow, what amazing places! I certainly plan to return sometime soon, visiting all five national parks in the area, with time to hike into picturesque settings timed for perfect light. But even in our rushed adventure I found the parks to be entirely photogenic, even in mid-day light, even from the normal shuttle bus stops and easy trails that were accessible with my family in tow. 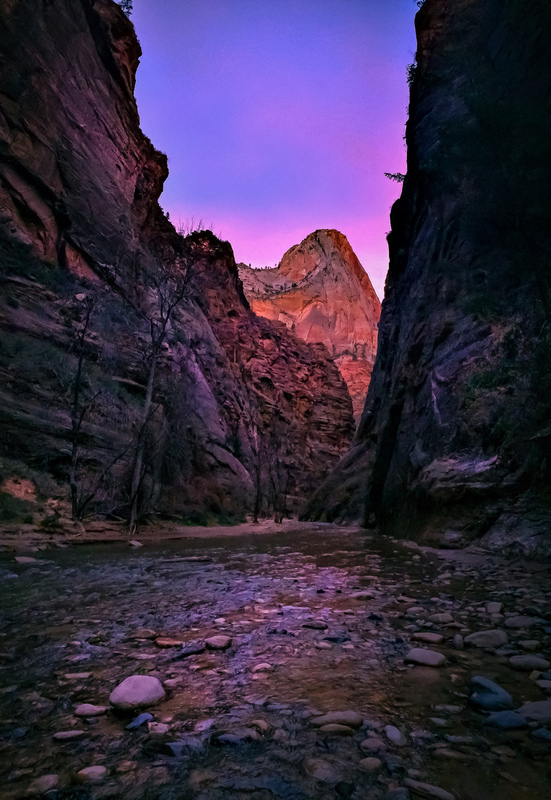 This is especially true for Zion, a comparatively small park where I found myself moving from one incredible landscape to another with just a short drive or hike. Gifford Canyon - Above Zion Valley, Pine Creek disappears into an impossibly tight and deep crevice. 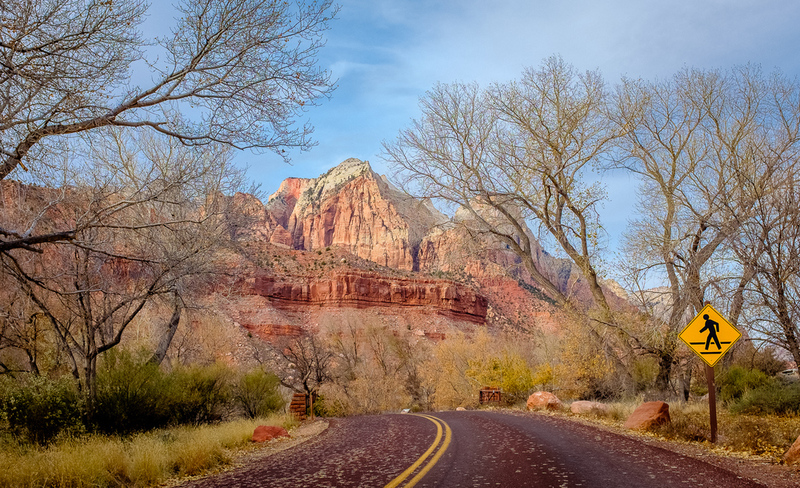 Red Asphalt - The roads in Zion are paved with a reddish asphalt. Blends in beautifully. Shadow Forest - Evergreens tucked in the shadows near Zion's Emerald Pools. This would be a neat place to wait for the perfect light! The Virgin River winding through Zion Valley below The Spearhead. 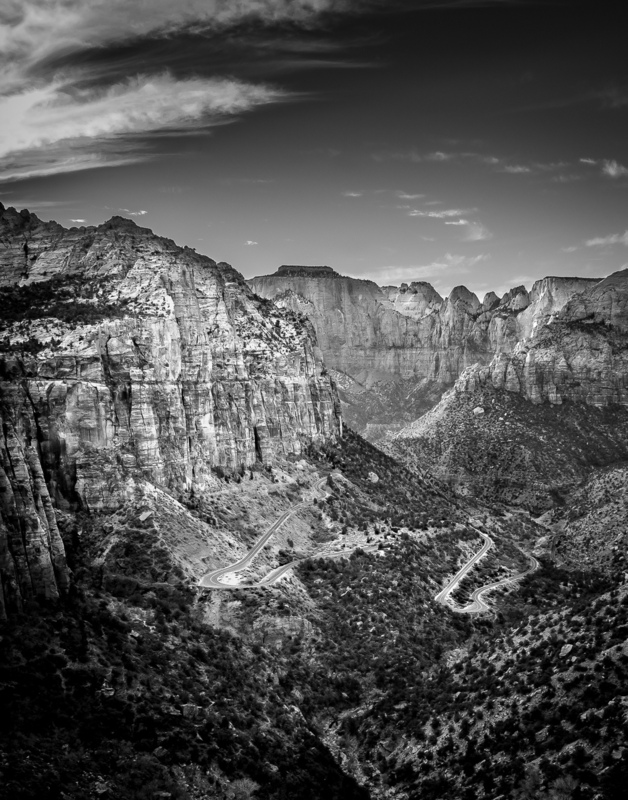 Lookout Trail - Above the Zion Valley, high desert trees cling to steep rock faces. Risky Selfie - Two fellows stand over top of Zion's Great Arch for a knee shaking selfie. Virgin River - The Virgin River winding through Zion Valley below Lady Mountain. Prior to Zion we were on the Southern rim of the Grand Canyon. Stunning as well. My first trip to either of these parks! Grand Canyon Sunset - The sun dips below the Grand Canyon rim, casting a spectacular array of colors. Light and Shadows - Setting sun paints distant peaks of the Grand Canyon. 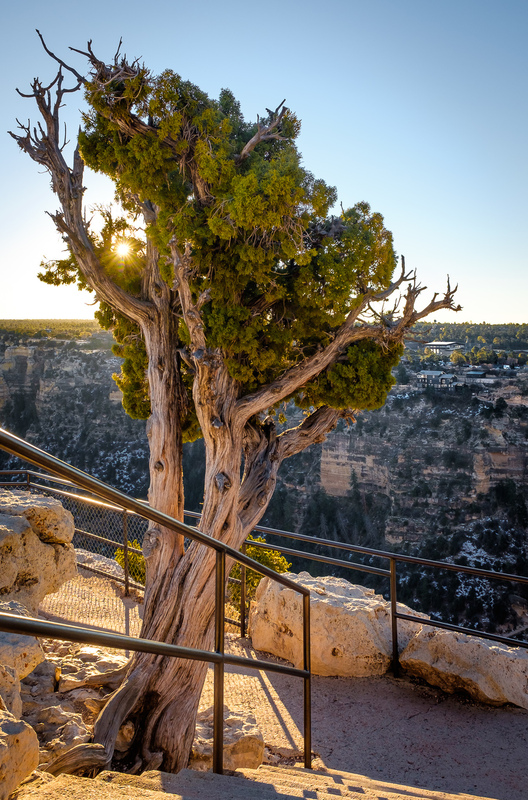 The sun breaks through a high desert tree as it rises over the Grand Canyon. I love the detail and contrast in the knotty bark. Koble Brother's studio is visible in the background. High Desert Tree - A tree stands against time along the rim of the Grand Canyon. The lodge is visible in the background, as well as Koble Brother's studio a bit further down on the canyon wall. Elk - I found myself surrounded by this family of Elk. I'm a tall guy, and she's looking down at me! Between Grand Canyon and Zion we stopped at the Hoover Dam. It is certainly an impressive engineering feat, yet I also found it to be somewhat ugly. A visually confused mass of power lines comes from every conceivable direction, guided by topsy turvy transmission towers down into a martian canyon devoid of vegetation. 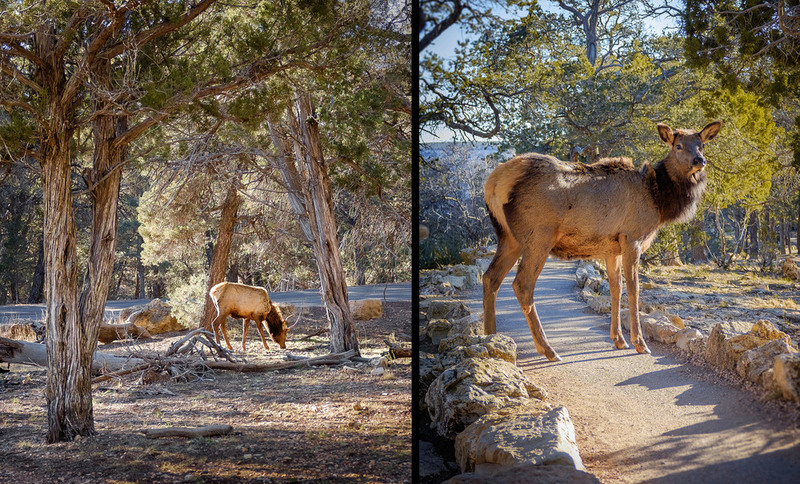 A harsh contrast to the natural beauty of the Grand Canyon National Park just a few hours away. Confusion - Power lines converge from seemingly every direction, dropping down to Hoover Dam's power generation stations. 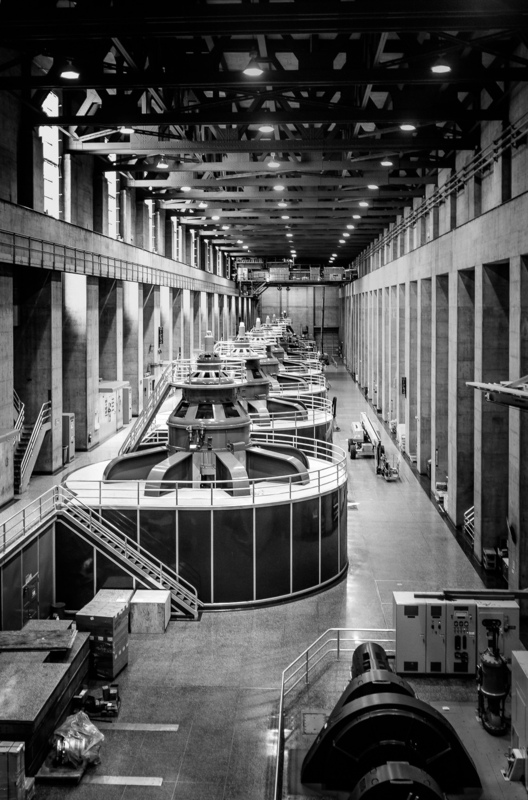 Alternating Current - One of the Hoover Dam generator halls. We spent a few days at Disneyland and Disney California Adventure. Perfect California skies each day, of course. 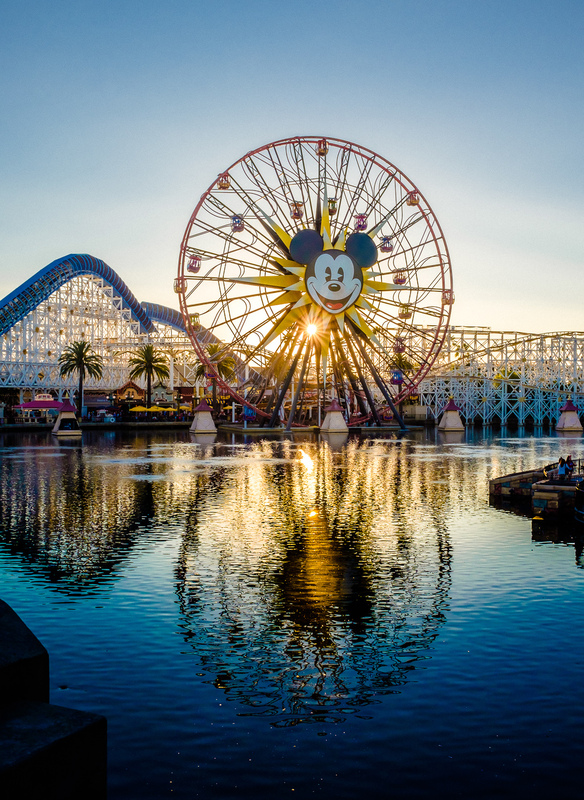 The sun dips below Mickey's Fun Wheel at Disney's California Adventure. A full moon rises over the Tomorrowland area of Disneyland. Finale - Waiting in line for our final ride at Disneyland, Thunder Mountain. Over our 3,300 miles we drove through some big cities, though none stopped us up like San Francisco. Literally. We enjoyed this view for almost two hours, slowly working our way up the street toward the Bay Bridge. We certainly didn't time that very well. But San Francisco is a beautiful city, and the new Bay Bridge was a treat when we did finally reach it at sunset. San Francisco Traffic - We came off the Golden Gate at 3:30pm, made it to the Oakland Bay Bridge after 5:30pm, spending most of that time on this one street. Patience grasshopper. I'll close with a selfie, and this is one of my favorites. I try to get in a good walk every day, and on this particular day I was in Zion National Park, joined by my wife and our youngest daughter. That's an epic walk! That's Me! Walking through Zion with my wife and our youngest.